On the lake in St Moritz this February there is a real cricket festival atmosphere. In parallel to the traditional Cricket On Ice (8-10 Feb 2018) the inaugural St Moritz Ice Cricket takes place (8 & 9. Feb 2018). Cricket On Ice, a 3 day Twenty20 round robin event, caters for recreational cricketers from St Moritz Cricket Club with guest teams from Highgate & Thames Ditton, England, and the Lyceum Alpinum in Zuoz. 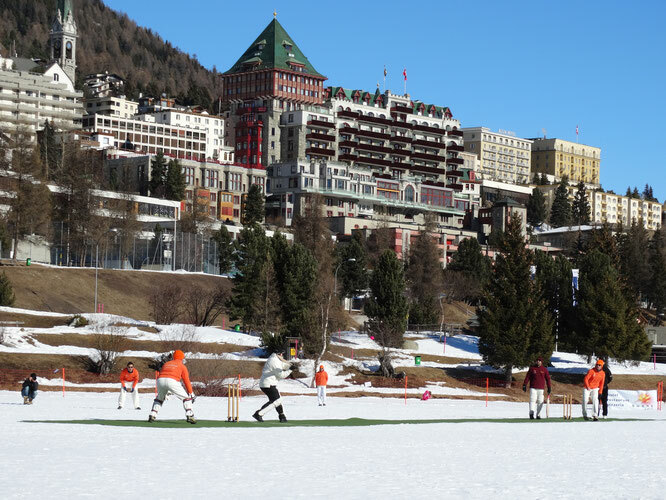 Cricket On Ice takes place on a field created specifically for this event by the St Moritz Tourist Board and can be found between the Yachting Club and the Ice-Hockey rink. It is free to watch Cricket On Ice but seating is limited. Reasonably priced lunches are served between matches and beverages are available all day. On the last day of the tournament the Cricket On Ice Gala Dinner takes place at the Hotel Steffani, tickets priced at Fr 125 pp. More information on the Cricket On Ice Trophy is available from the website at www.cricket-on-ice.com. Ice Cricket on the other hand has invited ex-international cricket stars from around the world to play two exhibition Twenty20 matches over two days. With a significantly larger budget, Ice Cricket will employ the White Turf infrastructure. The field will be located near the horse-racing finish line and spectators will be able to use the grandstands. A sizeable crowd is expected on the ice to witness the 'Diamonds' versus the 'Royals' made up of stars such as Verander Sehwag, Shoaib Akhtar, Graham Smith, Jacques Kallis, Lasith Malinga, Mohammad Kalif, Monty Panasar & Mahela Jayawardene. There is no charge to watch Ice Cricket, but tickets for the grandstand are available at Fr 40 each. Tickets are also available for "lunch with the stars" on each day are available for Fr 540 pp. Away from the ice, Ice Cricket's gala dinner is on Thursday 8th February at the Badrutt's Palace and tickets are priced at Fr 650 pp.